The best part of writing a blog is the readers. Those who share their ideas, their enthusiasm, their information so freely. And boy does The Legal Genealogist have great readers. Readers who really make this all worthwhile. And readers who go out of their way to help. Case in point: a lovely gentleman in Midland, Texas, named James Moring. Jim wrote to me back in February after reading about my Cottrell family here in the blog. He said he’d been looking through some materials at the Midland library including high school annuals and had come across a Cottrell in the 1942 annual. Would I be interested? The photo, from the high school annual, was of my mother as a junior. And I absolutely adore it. Jim has sent city directory pages and a few other things and, just a day or so ago, a lovely surprise. I recently posted about visiting the memorial marker for my Uncle Monte at Fort Rosencrans National Cemetery in a recent visit to San Diego, California.2 Jim read that, then read back to a 2012 post where I told the story of one terrifying night in Monte’s life. Now we know exactly where it came from. 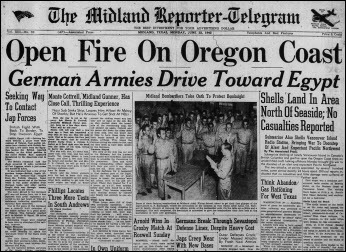 The article ran on the front page of the Midland, Texas, Report-Telegram on June 22, 1942. And I now have a copy of it. It’s readers like Jim that make writing this blog a joy. What a great gift. People who are into genealogy and familty history are the best. I do not envy you being involved with the launch of the BCG website this weekend. Good luck to you and the team who are working on it. Jim Moring, what a guy! Thoughtful enough to remember your family names and recognize them when reading the newspaper article or, even better, specifically looking for a newspaper article with your family names. Kudos to Jim! Thanks for the kind words, Roz, and I couldn’t agree more about Jim Moring. What a lovely thing for him to do! Happy Day, Judy! Readers like Jim Moring really make it all worthwhile. (BTW, that’s the newspaper that my Midland great-grandparents and cousins used to read). On your webpage …./2015-most-bang-for-the-dna-buck/ , do you have an update on all that information that fits 2017?? I’m still waiting for the dust to settle a little with some of the newer testing companies, but for now I am still recommending the same things I did in 2015.